Our staff will help you find PT observation hours, fit prerequisite courses into your major, and prepare to apply to the DPT programs in which you are interested. There are three DPT programs in Washington State, and 228 programs across the US. 40 to 300 observation hours in at least two different PT settings. An essay for the PTCAS answering a specific question, and one or more essays for supplemental applications addressing your reasons for choosing PT and preparation for the field. Strong letters of recommendation (up to four). Students typically apply to three-year Doctor of Physical Therapy graduate programs during the summer/fall after junior year. In addition to a bachelor’s degree, applicants must have completed specific prerequisite courses. 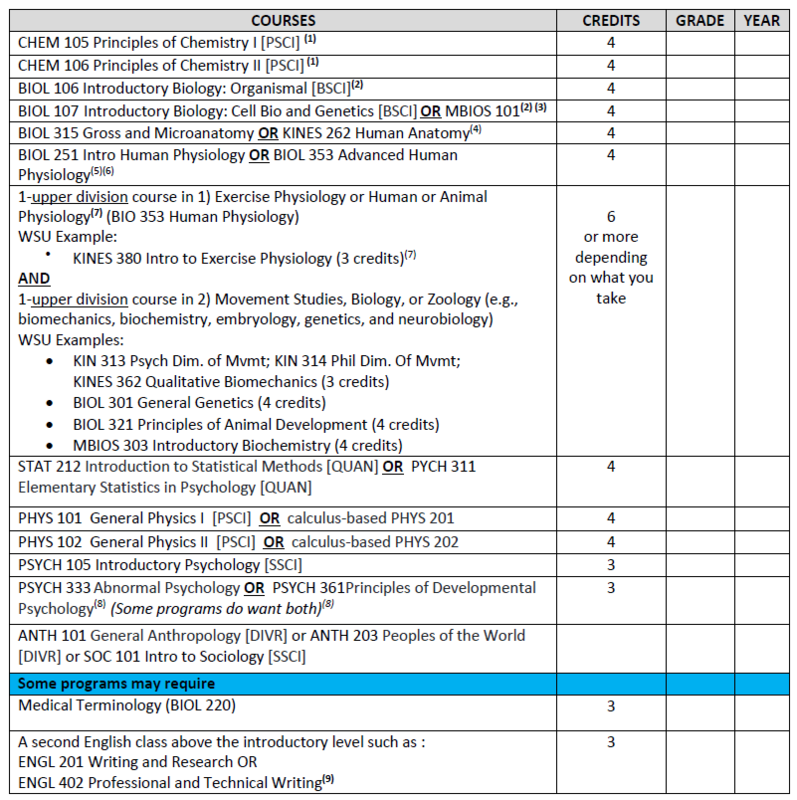 Criteria varies by program, but generally includes anatomy, physiology, a year each of general biology, general chemistry, and physics, plus statistics and introductory, developmental, and/or abnormal psychology. While you can major in anything, popular majors for students at WSU include kinesiology and biology. 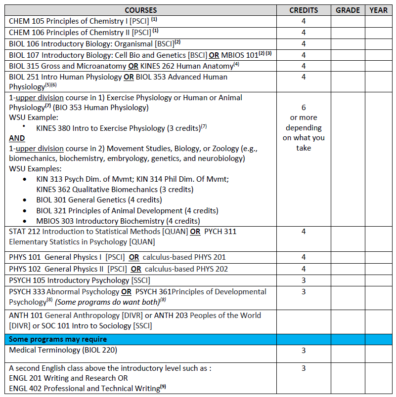 Degree requirements will determine which prerequisite courses must be completed in addition to those for the major. A centralized application service called PTCAS allows applicants to use a single Web-based application and one set of materials to apply to multiple PT programs. Click here to print or save! Profiles hundreds of occupations and describes what they do, work environment, how to become one, average pay scales, and more. Each profile also includes BLS employment projections for the 2010–20 decade. A YouTube video from MyCareerRX that details the job description and general responsibilities of a physical therapist. APTA is a professional organization whose membership includes more than 85,000 physical therapists (PTs), physical therapist assistants (PTAs), and students of physical therapy. The APTA website linked above is a great resource for obtaining general information about the field of Physical Therapy. Valuable information from APTA about what a career in physical therapy will look like and what motivates physical therapists to choose this profession. A list compiled by APTA of diagnosable health conditions that can be effectively treated by a physical therapist. This resource can help you get a clearer picture of the technical side of physical therapy. PTCAS allows applicants to use a single web-based application and one set of materials to apply to multiple PT programs. It is a service provided by the APTA.